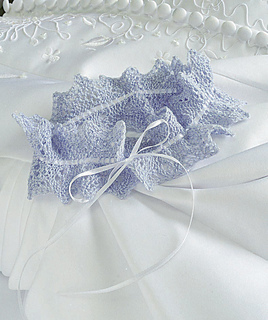 These lace garters are a delicate way to carry on the garter tradition. Worked in blue to fit the Victorian rhyme (Something old, something new, / something borrowed, something blue …), both pieces are worked in garter stitch, making them reversible. The cast-on is along the short edge, making them easy to fit. Adding more repeats of the lace pattern will allow the bride to ruffle the lace, if desired.